Mini's biggest model is suddenly a lot faster thanks to the JCW treatment. 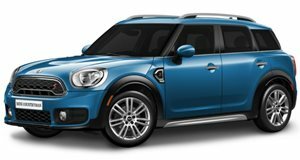 The new Mini Countryman is the biggest Mini ever made but the automaker knows that “fun to drive” is still its brand identity. To that end it has launched the new John Cooper Works Countryman, a model with the distinction of having the most powerful engine ever put into a Mini. The turbocharged 2.0-liter four-cylinder makes 231 horsepower and 258 lb-ft of torque. A six-speed manual transmission is standard and an eight-speed automatic is also offered. The JCW Countryman is equipped with all-wheel drive, which in Mini speak is called ALL4. With its beefy new engine and AWD the JCW Countryman does 0 to 60 mph in 6.2 seconds regardless of whether it's manual or automatic. Top speed is 145 mph. New Brembo brakes (four-piston Brembos are up front) provide the stopping power while “a particularly tight set-up of the suspension and damping systems” and a reworked steering system help to ensure stability and agility through corners. Eighteen light alloy wheels are standard but 19" wheels can be optioned. The exterior mods are more show than go, although the fog lights were ditched for cooling inlets. We also kind of want to hear the growl that the sports exhaust makes. On the inside the changes are mostly cosmetic and include a new shifter, steering wheel and sports seats. Pricing was not given but Mini did say that the John Cooper Works Countryman would make its world premier in April at the 2017 Shanghai Motor Show. It will be launched shortly thereafter. While we’re sad that Mini’s new models keep growing in size we do love that the automaker is giving the world driver-friendly alternatives to crossovers. The new Countryman is stupidly spacious and can be had with a six-speed manual and a 231-horsepower turbocharged engine. In a world slowly being taken over by crossovers equipped with CVTs that’s something to get excited about.